Pedal Finder Launches – First Pedal Giveaway Announced! Home » Contest » Pedal Finder Launches – First Pedal Giveaway Announced! Over the last few months, Pedal Finder slowly and deliberately unfolded onto the internet. There were no big announcements, no yelling from the rooftops. Primarily we invited friends to come and check out the site and leave reviews for the pedals they knew about in order to help us discover any bugs in the system. We’d like to first thank all our friends who contributed valuable input into how the site works and for all the wonderful information they submitted to Pedal Finder. Without volunteer testers willing to give their time, Pedal Finder would have taken much longer to come to life. So thanks everyone! Our second action is to announce that Pedal Finder has officially launched and it’s time to spread the word! If you’ve never been to Pedal Finder, please check it out. As one contributor stated, “this is like a dating site, but for pedals.” What Pedal Finder does is use the meta-data it gathers from the extensive pedal review process to create new ways for users to search for guitar and bass effects. Instead of searching just by type of effect or by manufacturer, you can search for pedals based on the type of music you play and include variables like the type of amp, pickups and instruments you use. It provides you with a completely new way to discover effects pedals that you may not know about. 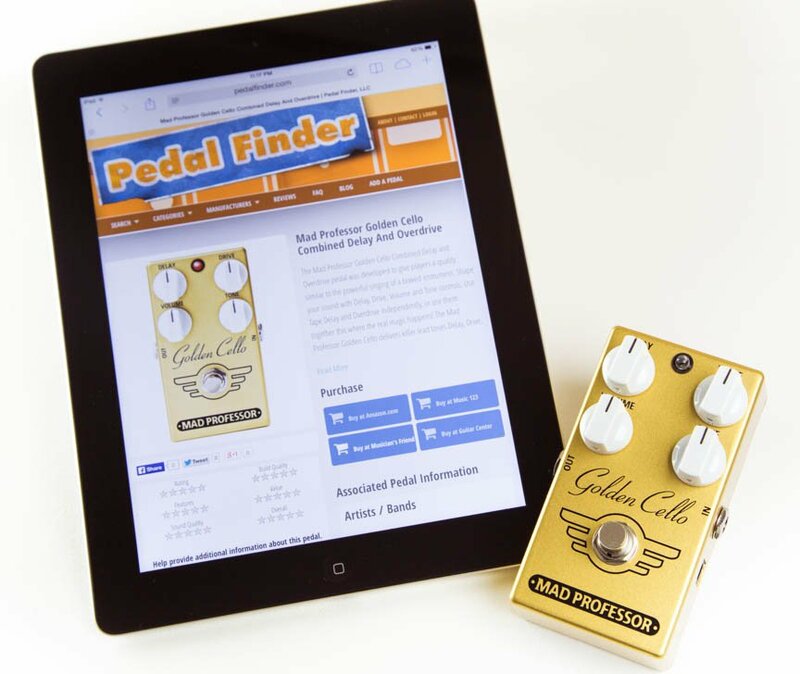 You can get more details about all the Pedal Finder search options here. The best part of launching Pedal Finder is that we can finally announce the first pedal we are giving away on the site. It’s a Mad Professor Golden Cello (typically lists for $150). The Golden Cello combines delay effects with overdrive that gives guitarists and bassists the effect of playing an instrument with a bow – thus the name. On top of that, you can you can mix the two together or use them each independently of one another. A great pedal from a great pedal company! A random entry will be selected on May 24th, so you have tons of time to rack up some entries. So how do you enter to win the giveaway? It’s easy. If you haven’t already, sign up for an account at Pedal Finder and then simply start sharing your opinion and knowledge about the effects pedals you’ve used or owned. You can leave a review for a pedal that is currently in the database, or submit a pedal that currently isn’t in the database. You can tell us about the artists you know that use certain pedals and link pedals to useful YouTube videos explaining how the pedal works and sounds. Each of these actions gets you an entry into the drawing and a chance to win. The more of your knowledge you pour into Pedal Finder, the more entries you’ll have to take the Golden Cello home! And, as if that wasn’t enough, if you ‘Like’ Pedal Finder on Facebook and your entry is chosen, our good friends over at Effects Bay are going to throw in a free Pedal Labels System Pack and an Effects Bay t-shirt! If you don’t know about Effects Bay you can check them out here. And, we’ll make it easy for you to like the Pedal Finder page on Facebook. Just click ‘like’ below! That’s all for now. We are extremely excited to launch and look forward to hearing from you. Congratulations friends!! This page is awesome! This is a great idea guys, I’m happy to have come across the site and I’m excited to be a part of the community here! I can never get enough info on tone, this site looks like it will be lots of fun…Thanks!